Just one unit of blood can help as many as five children! Atrial septal defect (ASD) is a type of congenital heart disease, a heart condition your child is born with. ASD means there is a hole in the septum, the wall between the heart’s upper chambers (atria). ASD occurs when the baby’s wall does not form properly during pregnancy. The heart team at Children’s National Heart Institute uses the latest cardiac catheterization technology to repair these defects. Our cardiac cath team helps children avoid the need for surgery by using one of the advanced catheterization treatments available. To close the ASD, we choose the closure device that best suits your child. There are two FDA-approved devices available in the United States. This minimally invasive procedure means your child has less pain, a more comfortable recovery, and a quicker return to daily activities. As your child grows, his or her own tissue grows over the implant, as it becomes part of your child’s heart. These two devices work in similar ways, though there are slight differences in design. We will discuss with you the benefits of each device and choose the one that offers your child the best outcome. Our team has extensive experience with each device. On the day of the procedure, our expert pediatric cardiac anesthesiologist will place your child under sedation. He or she will not feel any pain. The anesthesiologist will continue to monitor your child during the procedure. Learn more about anesthesia at Children’s National. Attach the occluder device to a catheter (a long, thin tube). Insert the catheter into a blood vessel near your child’s groin. Thread the catheter to the heart and locate the site of the defect. Push the occluder device out of the catheter and into place, where it covers the edges of the defect to seal it closed. Remove the catheter and close the incision. 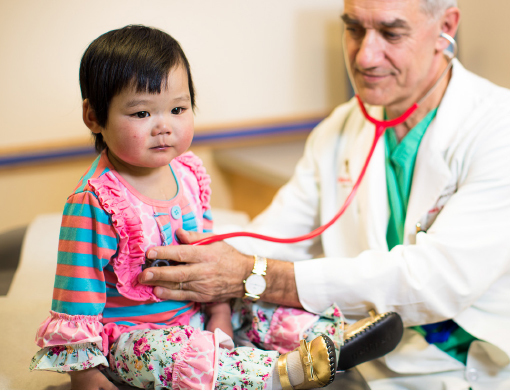 Transfer your child to our comfortable, child-friendly Cardiac Procedure Recovery Unit (CPRU), where our experienced pediatric nursing team will provide expert recovery care. Discuss discharge, recovery, and follow-up instructions with you. For more information, call us at 1-202-476-2020. Our heart team performs hundreds of cardiac catheterization procedures a year, treating patients of all ages, including those with complex heart conditions. Learn about the Melody Transcatheter Pulmonary Valve Therapy, an advanced treatment for pulmonary valve disease. Learn about our expert cardiac catheterization procedures to treat ventricular septal defect (VSD), helping children avoid surgery. Learn about our expert cardiac catheterization procedures to treat patent ductus arteriosus (PDA), helping children avoid surgery. A lead must be removed when it becomes infected or causes a mechanical problem in the heart.